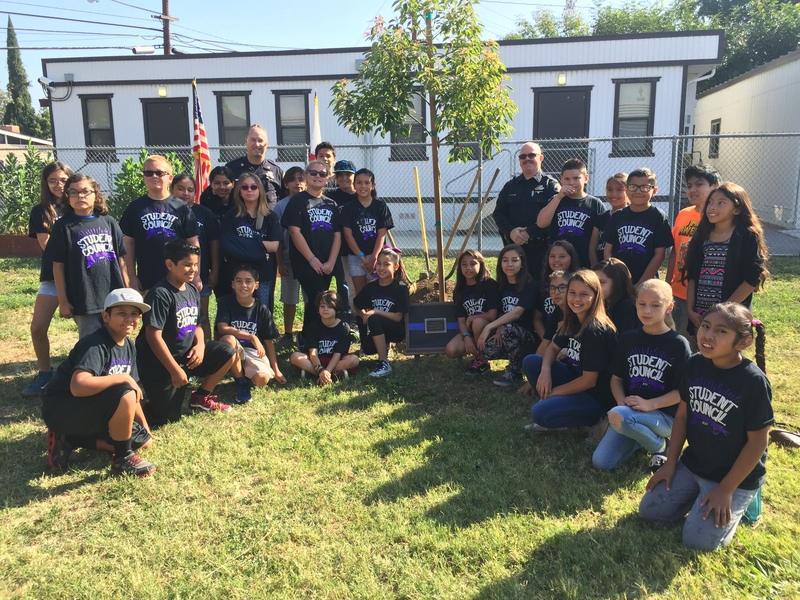 EAST WHITTIER – Mulberry Elementary School students and staff planted a camphor tree in honor of fallen Whittier police Officer Keith Boyer on May 23, part of a tribute that included a campus-wide Loose Change drive that raised over $700. Mulberry Student Council members, who led the fundraising drive, presented the Boyer family with a check for $500 and used the remaining funds to engrave a commemorative plaque for the memorial. The camphor tree was donated by the City of Santa Fe Springs. Mulberry Student Council advisers Sandi Frickle and Lisa Liew coordinated the Loose Change drive, originally intending to raise money for a tree. “Helping to raise money to honor Officer Boyer was special for me,” Mulberry fourth-grader Amanda Frickle said. “It taught me to be responsible,” Mulberry Student Council President Sofia Lopez said. 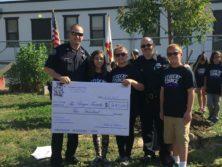 Eric Borunda, an arborist with the City of Santa Fe Springs, whose son Evan is a Mulberry fifth-grader, responded to the Loose Change drive by arranging for the city to donate the camphor tree. That allowed the students to make a contribution directly to the Boyer family. “I feel really happy that I was able to be a part of the memorial tree planting,” Borunda said. Whittier police Officer John Scoggins and Cpt. Mike Davis attended the ceremony on behalf of the department and Boyer family. 06_21_17_EWCSD_Mulberry1: Mulberry Elementary School Student Council members pose next to a camphor tree and plaque dedicated to the memory of Whittier police Officer Keith Boyer, during a ceremony on May 23. A campus-wide Loose Change drive enabled the students to donate a $500 check to the Boyer family. The tree was donated by the City of Santa Fe Springs. 06_21_17_EWCSD_Mulberry2: Whittier Police Cpt. Mike Davis and Officer John Scoggins hold a commemorative check for $500 given to the family of Officer Keith Boyer on May 23 during a memorial tree planting ceremony. Mulberry Student Council students led a campus-wide Loose Change drive to raise money for Boyer’s family in appreciation of his bravery and heroism. Whittier Police Cpt. Mike Davis and Officer John Scoggins hold a commemorative check for $500 given to the family of Officer Keith Boyer on May 23 during a memorial tree planting ceremony. Mulberry Student Council students led a campus-wide Loose Change drive to raise money for Boyer’s family in appreciation of his bravery and heroism. 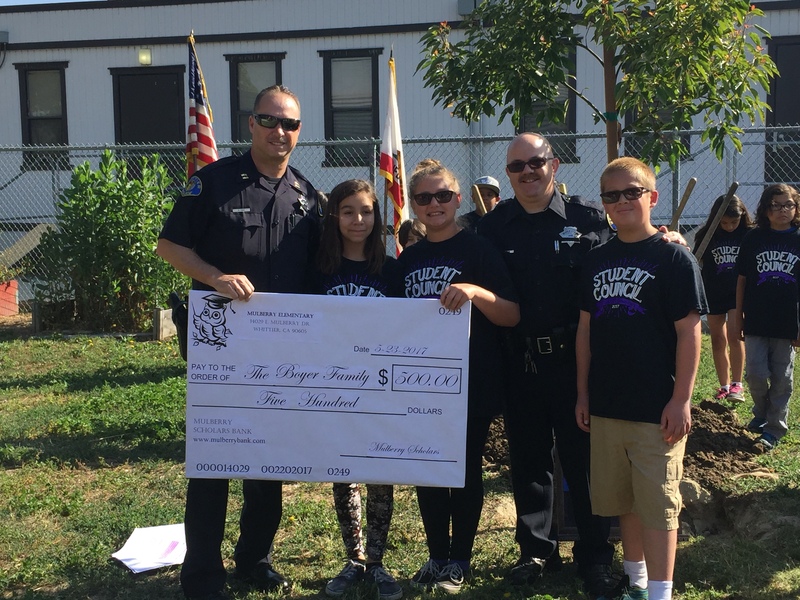 Mulberry Elementary School Student Council members pose next to a camphor tree and plaque dedicated to the memory of Whittier police Officer Keith Boyer, during a ceremony on May 23. A campus-wide Loose Change drive enabled the students to donate a $500 check to the Boyer family. The tree was donated by the City of Santa Fe Springs.